He moved to New York City in 1954 and joined the pop art movement, using distinctive imagery drawing on commercial art approaches blended with existentialism, that gradually moved toward what Indiana calls "sculptural poems". Indiana's iconic work LOVE was first created for a Christmas card for the Museum of Modern Art in 1964 and later was included on an eight-cent United States Postal Service postage stamp in 1973, the first of their regular series of "love stamps." The first serigraph/silk screen of "Love" was printed as part of an exhibition poster for Stable Gallery in 1966. In 2008, Indiana created an image similar to his iconic but this time showcasing the word "HOPE," and donated all proceeds from the sale of reproductions of his image to Democrat Barack Obama's presidential campaign, raising in excess of $1,000,000. 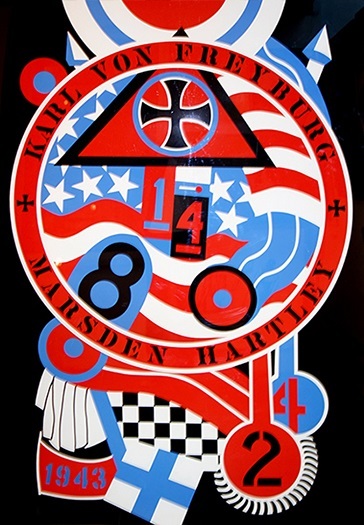 Click the button below to add the Signed The Hartley Elegies - KvF II By Robert Indiana Retail $10K to your wish list.